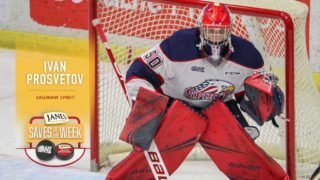 Seventeen OHL graduates have earned medals at the 2018 U SPORTS University Cup that wrapped up this past weekend in Fredericton, NB. London Knights graduate Brendan Burke claimed the lone gold medal as a member of the University of Alberta Golden Bears, helping guide them to their 16th National Championship and third in five years after winning back-to-back titles in 2014 and 2015. Fourth-year Golden Bear Stephane Legault (Edmonton Oil Kings) recorded a tournament-leading seven points, including the Bears first goal in the championship final on Sunday, earning tournament MVP honours. Luke Philp (Red Deer Rebels), Wil Tomchuk (Prince George Cougars) and Jamie Crooks (Victoria Royals) also scored for the Bears. Rookie goalie Zach Sawchenko (Moose Jaw Warriors) stopped 24 of the 26 shot he faced. 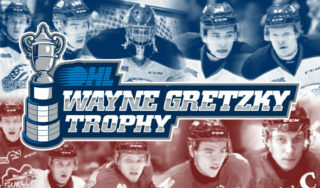 A total of 12 OHL grads return home with silver medals as members of the StFX X-Men as Daniel Robertson (Windsor Spitfires) and Michael Clarke (Peterborough Petes) had goals in the championship loss. 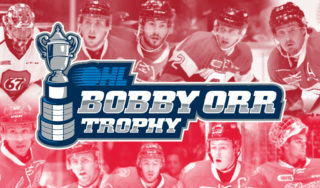 An additional four OHL grads earned bronze with the UNB Varsity Reds following a 5-4 overtime win over the Saskatchewan Huskies on Alexandre Goulet’s (Victoriaville Tigres) game winner. Matt Murphy (Saint John Sea Dogs), Tyler Boland (Rimouski Oceanic) and Olivier Leblanc (Cape Breton Screaming Eagles) also scored for the Varsity Reds while Goulet found the back of the net twice. Saskatchewan markers came from Levi Cable (Kootenay Ice), Jaimen Yakubowski (Moose Jaw Warriors), Mackenzie Johnston and Carson Stadnyk (Everett Silvertips) as the Huskies settled for fourth. 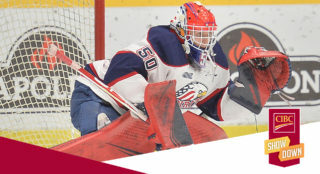 Peterborough Petes graduate Michael Clarke of the StFX X-Men was also named to the tournament all-star team after registering seven points (2-5–7) over three games. Here’s a closer look at OHL graduates who earned medals in Fredericton. A total of 176 CHL graduates competed across eight teams at the 2018 U SPORTS University Cup Championship, representing over 80% of all players in the tournament. For more details visit canadawest.org and usports.ca.